Dry off the stew beef with a paper towel as this helps it brown when cooking. Brown the beef a few pieces at a time in the melted bacon fat/olive oil mixture. As you finish each piece, place in a bowl til all pieces have been sauted. Once all the beef has been sauted, add your sliced carrots and onions to the bacon fat/olive oil mixture and saute until the onions become translucent. 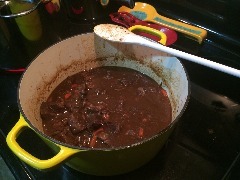 Once finished, drain off the liquid and return the beef back to pot. Preheat oven to 450. Along with your beef, add 2 tablespoons of flour, salt and pepper and stir. Place pot in oven for 4 minutes. Stir the contents and place back in the oven for an additional 4 minutes. Turn heat down to 325 and put the pot back on the stove top. 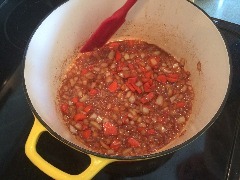 Add 3 cups of wine, tomato paste, herbs, garlic, cooked carrots and onions. 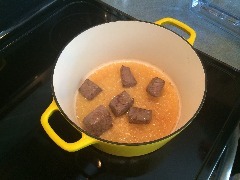 Add 2 - 3 cups of beef stock until all the beef is covered with the liquid. Bring to a simmer. Cover and place in the oven at 325 for 2 1/2 to 3 hours. After your beef has cooked in the oven, drain the beef, saving your liquid in a stock pot. 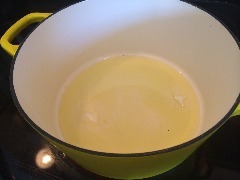 Simmer the liquid, skimming the fat off the top until it is completely removed. Reduce the sauce until it thickens up add the beef and veggies back into the pot. Once you have combined everything, serve over a bed of egg noodles or rice. The recipe that Julia Child's wrote called for either the pasta or rice, however, we served it with both to see which was better. If doing both, cut the amounts of pasta or rice in half. It was a split decision for our crowd, but delicious nonetheless. 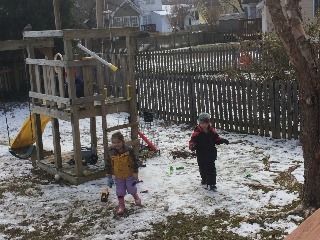 Snow Day number two. 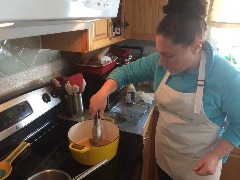 We had our friends over to play and while the kiddos played in the snow, the grownups attempted to tackle Julia Child's Beef ​Bourguignon from Mastering the Art of French Cooking published in 1961. The recipe was more involved than I first expected, but the four adults found a way to make it work and it was delicious. 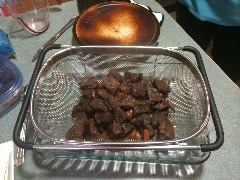 The recipe calls for three pounds of stew beef, which was more than enough for the eight of us. 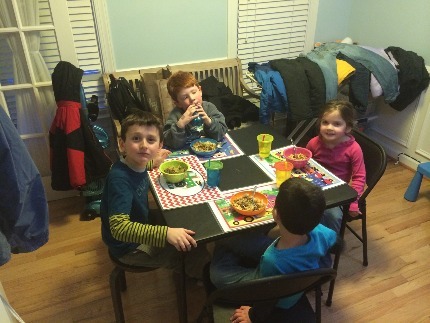 We used both egg noodles and rice as we had a mixed group of eaters and wanted to make sure everyone was happy. The beef had a faint sweet tang from the wine and was so tender, you wouldn't even need teeth to eat it. I am not a fan of veggies, and the carrots and onions basically dissolved in the liquid which allowed me to eat my veggies without even knowing it! Served with the rice provided a nice hearty meal that was a great follow up to time spent outside in the snow. The soft noodles provided a velvety rich flavor that complimented the tang of the beef. We also served this with a side of asparagus. Scared of tackling one of the most famous french dishes of all time? 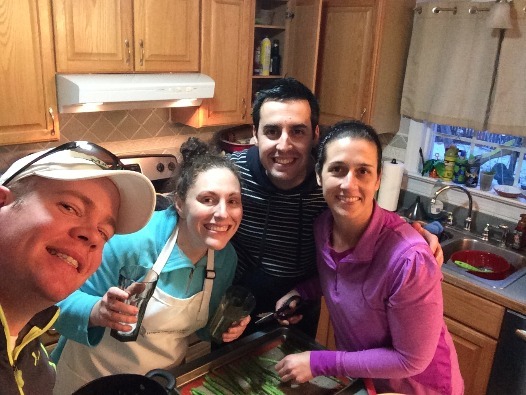 Invite some friends and take it on together because where there's a meal, there's a way! It was amazing! Julia knows good food!